To forget this Beauty is to lose sight of the Heavenly Kingdom. Above all we must learn to desire Beauty. 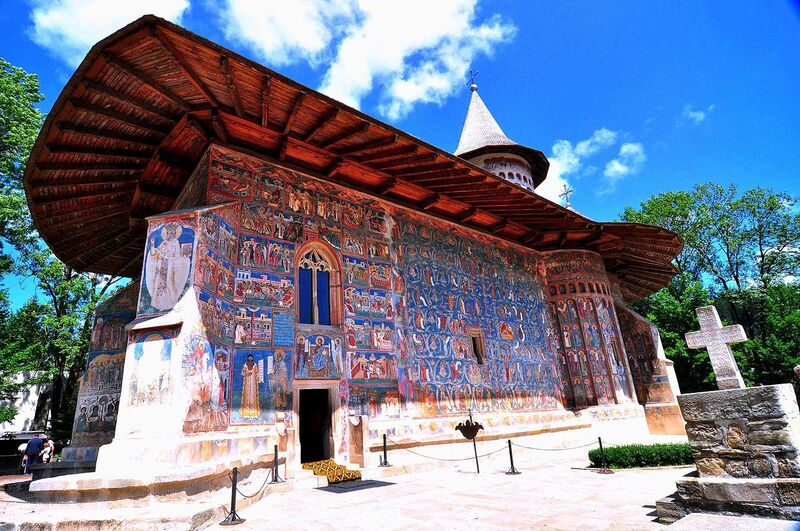 It was not for theology or propriety that the Byzantines so adorned their temples. It was for Beauty. In Beauty lies Truth, and by it we show our Love for God. … This is a great difference from Western architecture. A Gothic church is a monument offered up to God. It is an attempt by man to order and beautify all that exists in creation. It points upward to God the Father who is outside of it, and prayers are directed likewise. 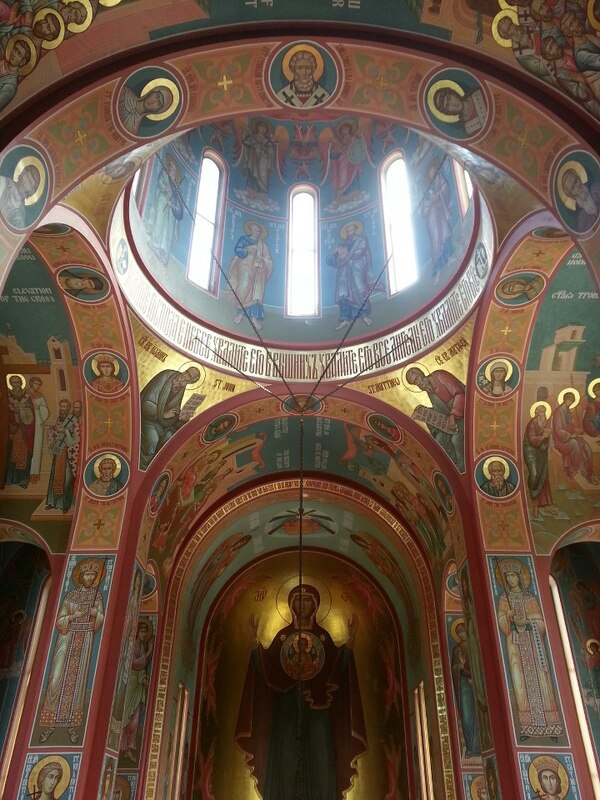 in contrast, an Orthodox church is introverted. 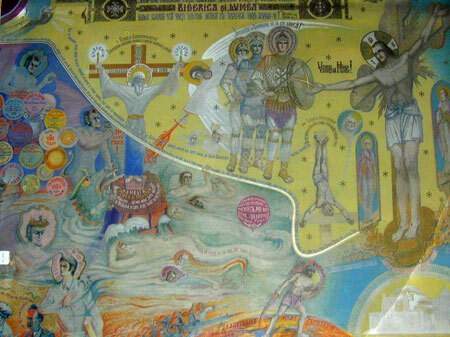 The interior represents Heaven, and to enter it is to step into the New Jerusalem. God dwells there among men, and they have no need of the sun, neither of the moon, for the Glory of God illumines it (cf. Revelation 21 : 23). Light pours into a Gothic church through great decorated windows. Broken into dazzling colors, it overwhelms the materiality of the walls. The stonework itself magnifies the effect, as it is thin and delicate, and carven with most delicate tracery. The weight of the stone is denied. The worshipper is at once conscious of the awesome radiance and power of the light without and the tenuous structure of the material within. The light beautifies the structure by dematerializing it, even until the stone itself looks like rays of light. 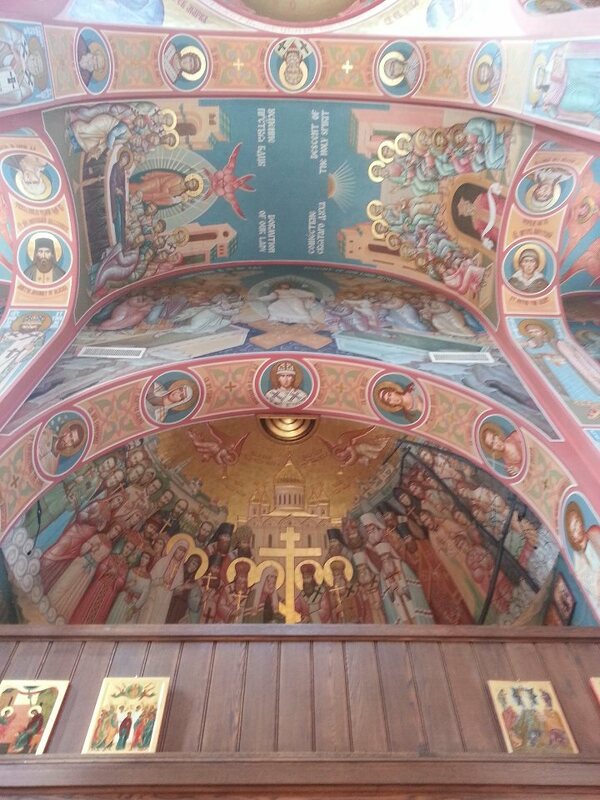 The walls of an Orthodox church are immensely thick and strong. The windows are small and up high, set deeply into the openings. The light is seen reflected off the thickness of the wall, rather than directly from the windows. In some Byzantine churches the window is translucent alabaster or marble, so that the light seems to glow from within the wall itself. 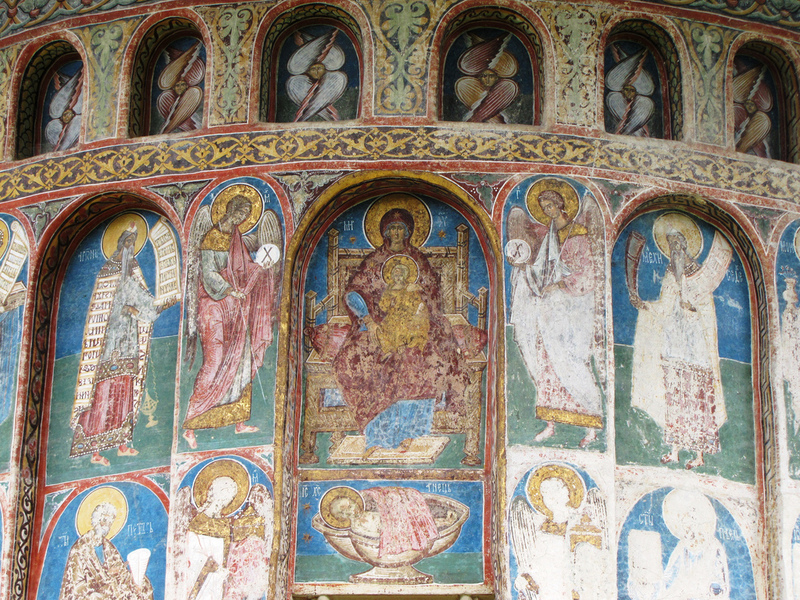 Gold mosaics or bright frescoes play the light from many surfaces. Polished lamps and inlaid furniture reflect highlights from every direction. Deep aisles or side chapels behind arches appear as mysterious shadows in the distance, which make the church look brighter by the rich contrast. This is mass transfigured by light. It is the same light as in the icons, holy and all- pervading, the Uncreated Light which emanates from god to his creation. The stone and plaster glow from within. They do not seem transitory, but more real. Walls and piers seem as silent and as still as ancient mountains. They are bathed with the Light of Christ, and are sustained and strengthened by it as we are. … A church building is the structure and organization of all the icons within it. As a unified edifice, these make up a single integrated icon which encompasses all the history and theology of the Church. The organization of the icons broadly follows three architectural axes. by the evangelists, representing the beginning of the church, and then the saints in their tiers below. To the medieval mind, hierarchy meant freedom; it was the mark of identity and security. 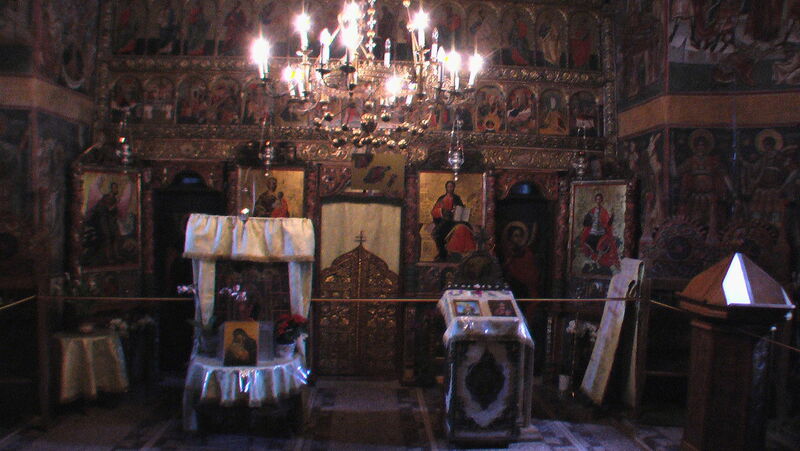 This axis and hierarchy exist also in the iconostasis as a miniature version of the same concept. The vertical axis has another interpretation which is the approach of god and man. The dome, most brightly lit and filled with angels, is heaven. 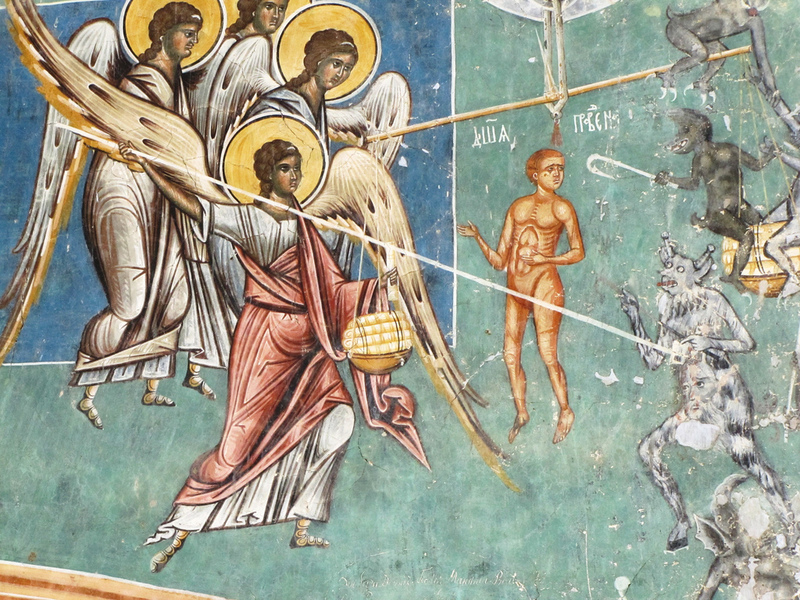 It touches the nave at the pendentives, where the evangelists are painted, because they record the meeting of god and man. 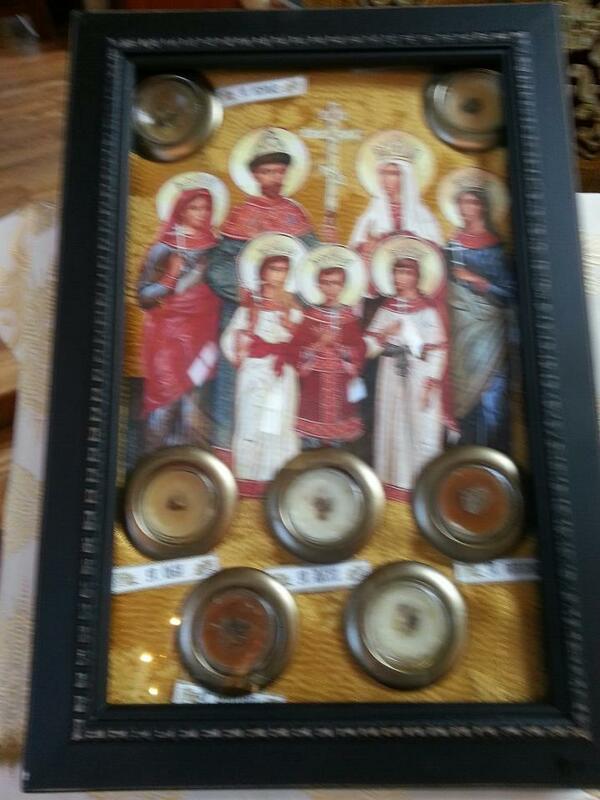 alternately, some churches have four great feasts which are theophanies at the pendentives, for the same reason. 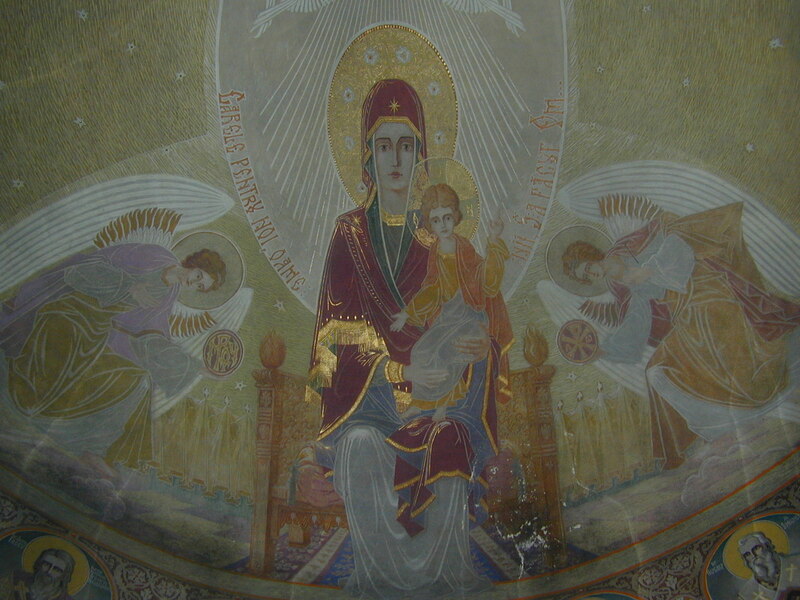 The Theotokos of the sign in the apse represents the Church reaching back up to god. 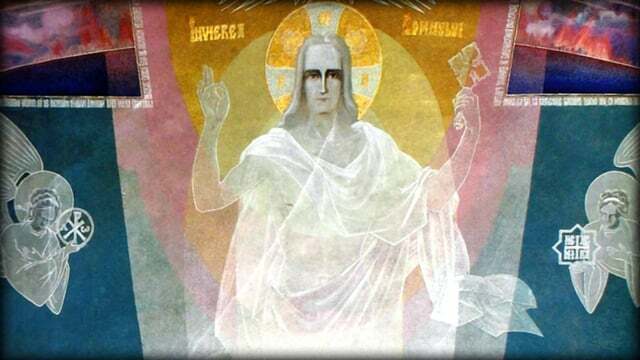 Christ appears in the sign before her, emphasizing that by the Incarnation He is already with Her. The third axis is circular and horizontal, the interplay of icons cycling around the nave and relating to one another across it. This axis often por- trays the flow of time, although it can express many other relationships as well. 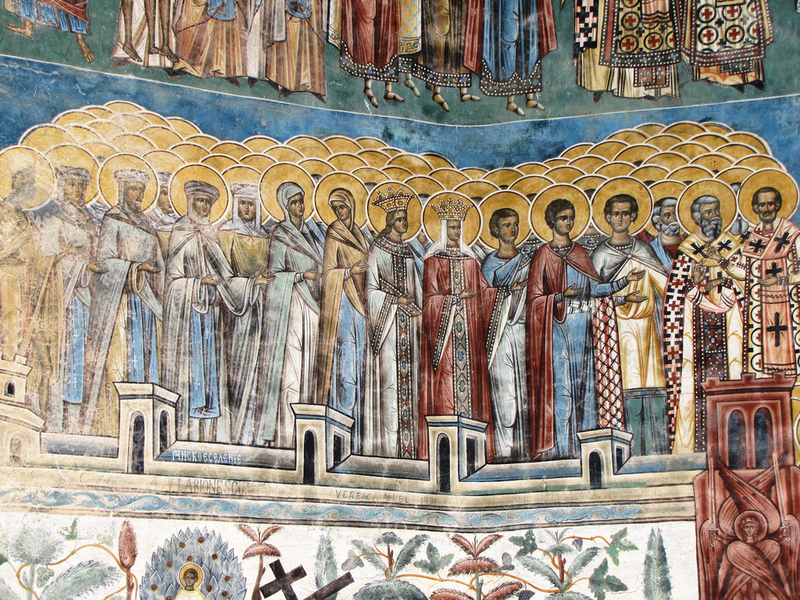 The great feasts may be ordered chronologically around the nave, or specific feasts may be combined or face one another to highlight theological connections. In a large church there may be hundreds of biblical and historical scenes, and their placement with respect to one another and to the principal feasts can suggest almost limitless depths of interpretation. 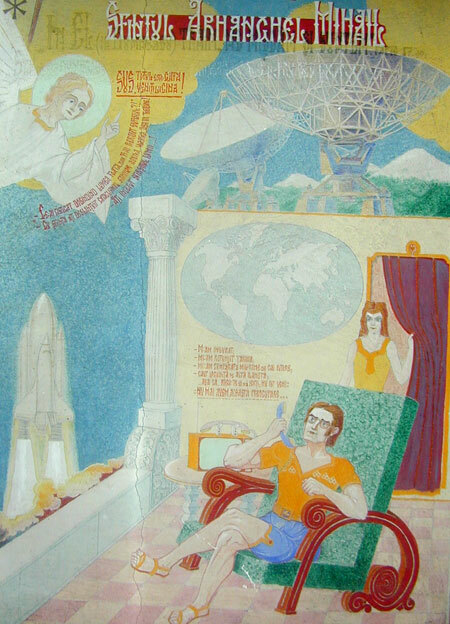 … Of all forms, the cube and the dome are the most sacred and universal in architecture. The cube or square represents the earth, while the dome symbolizes the sky. It was ever the desire of the Romans to combine these forms and represent the universe. They achieved this at Hagia Sophia. The square nave has the most water-like pavement in the world. Sheets of wavy blue-gray marble flow from the altar like the river of the water of life from the Throne of God. Rows of columns rise from the banks like trees. Amazingly, the builders abandoned the thousand-year-old tradition of the Classical orders, and crafted a new type of capital which looks like the fronds of palms blowing in the wind. The arches above the capitals are decorated similarly. The whole nave is like a walled garden of unimaginable scale, the very image of Paradise. … In Islam they build mosques that have the quality of jewel boxes. They are ornamented with a tremendous richness and regal splendor, but are completely devoid of anything iconographic, anything representational. They seem like abstract spaces, as does the Muslim worship within these spaces — the bowing down toward a mihrab, which is, in and of itself, nothing, but only an abstract architectural gesture that indicates the direction of Mecca. And of course, the Islamic faith emphasizes that man is very low and that God is very high, and that, really, the two do not meet; they surely do not meet in the sense that they meet in Christianity. So regardless of how beautiful a mosque may be, mosque architecture has never sought to convey an impression that God is within the mosque. It only conveys the impression that man has attempted to dignify himself by beautifying the mosque to an extent that man might be found worthy to kneel before God (because, of course, one only kneels in a mosque). So, if it is true that the emissaries of St. Vladimir attended services in an Orthodox Church, a Catholic Church, and in a mosque, I think it’s very appropriate that they would have observed that only in the Orthodox Church does it seem that God dwells with men. 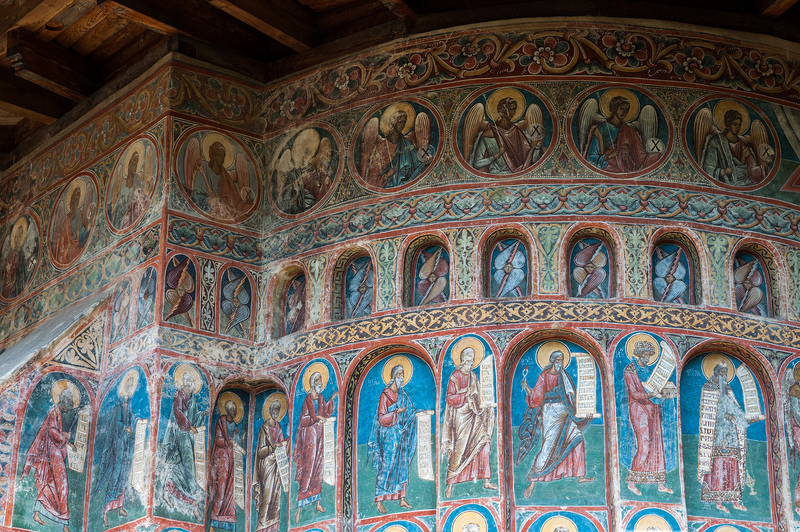 The very specific and deliberate attempt of Orthodox liturgical art is to convey that impression, and this is, of course, the fundamental gospel of Christianity. … A good modern building flooded with white light can be beautiful and people will often call such a building uplifting or inspiring. 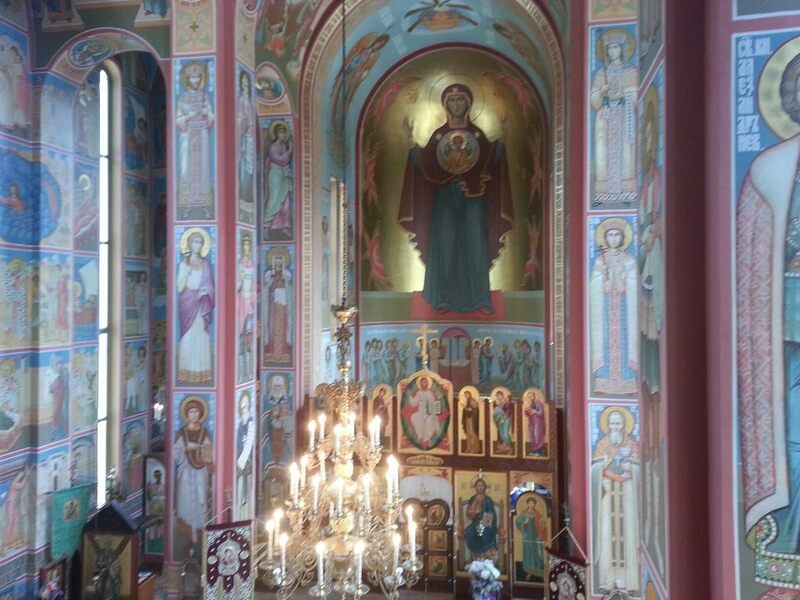 But we need to remember that the purpose of liturgical architecture, of an Orthodox church, is not to uplift and inspire but to make us mindful of the presence of God and the saints. 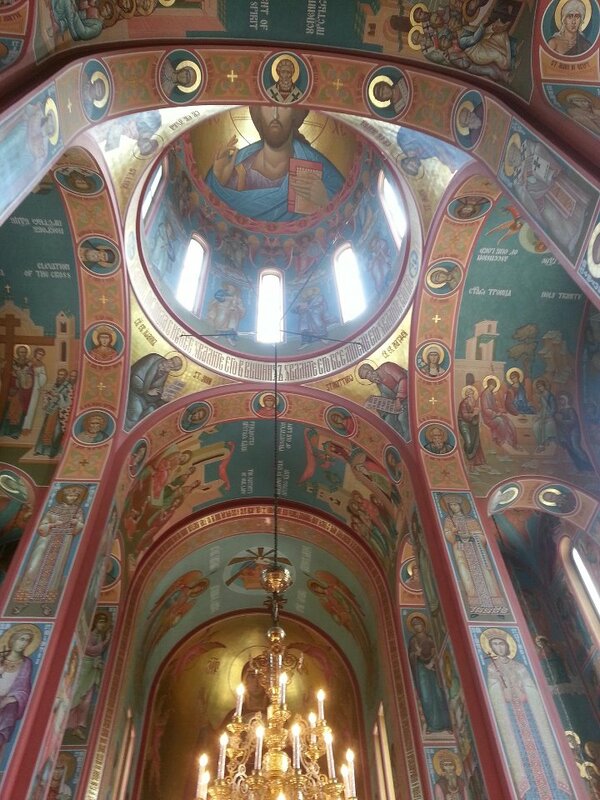 Traditional architecture does this iconographically by revealing the beauty of the uncreated light shining through the saints, through the icons, and by suggesting the veil of mystery and the cloud of witnesses around the altar. 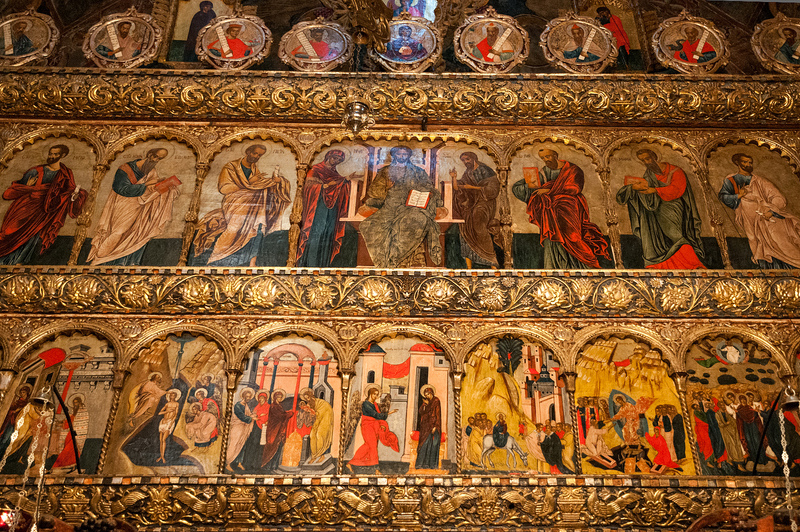 For this iconographic technology to be effective requires a certain dim and mysterious light so that the reflections of light off of the gilded icons can be seen as brilliant and even supernatural in the setting of a dark church. A church that is flooded with natural light robs the icons of their ability to shine more brightly than the sun. 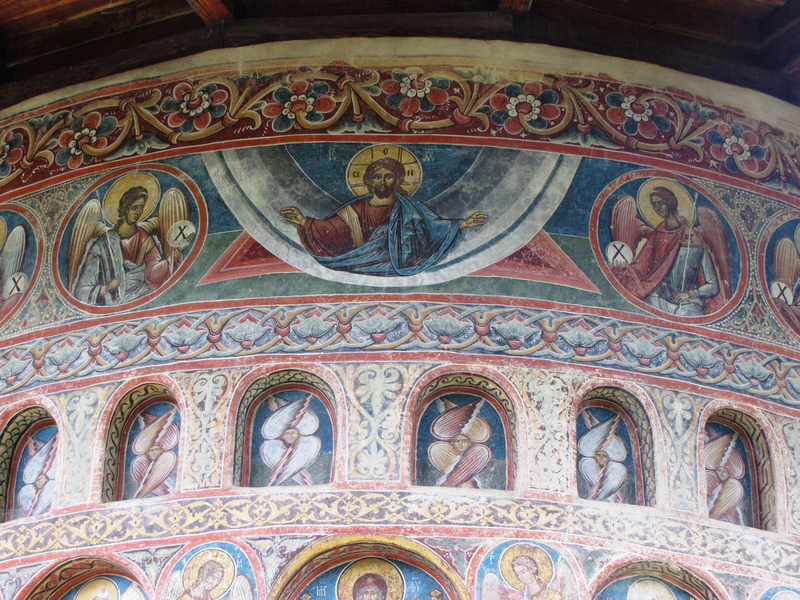 The frescoes at Voroneț feature an intense shade of blue known in Romania as “Voroneț blue”. 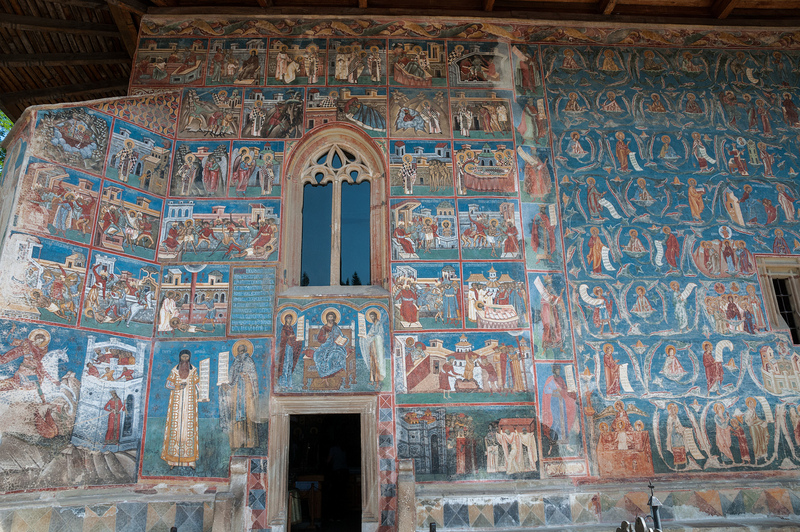 “The exterior walls — including a representation of the Last Judgment on the west wall — were painted in 1547 with a background of vivid cerulean blue. 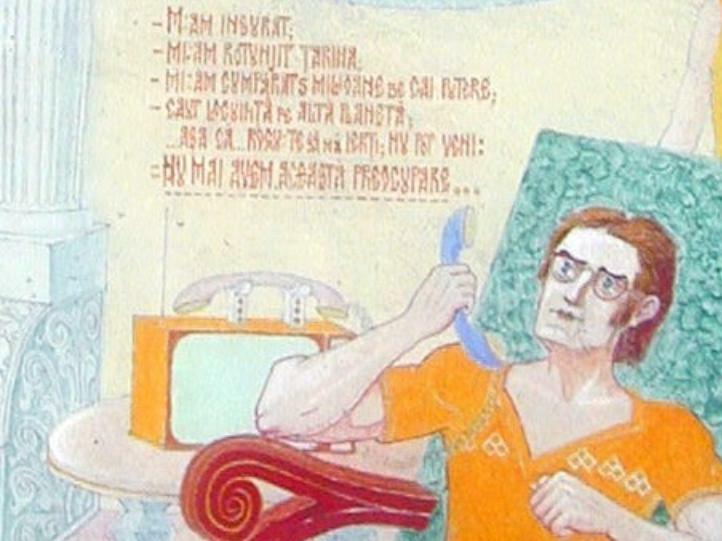 This blue is so vibrant that art historians refer to Voroneț blue the same way they do Titian red. 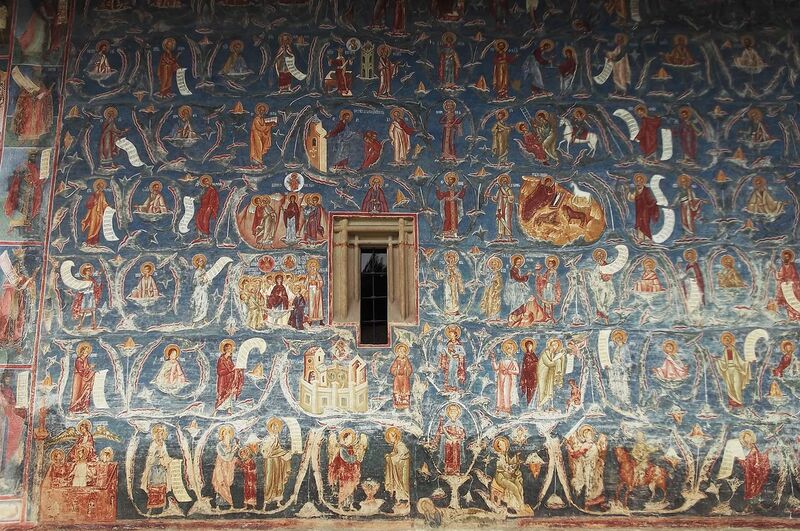 Monastery of Voronet has been declared World Heritage by UNESCO. Below are some great photos of the beautiful sacred building. Enjoy! 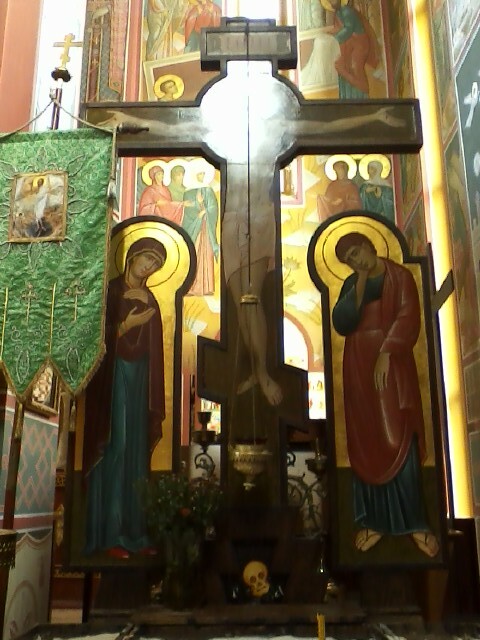 Standing in the Cathedral after Sunday Liturgy on August 12, 2012. In addition to its magnificent and historic iconography, completed in the 1990s following the dissolution of the USSR, the Cathedral houses the relics of many saints, including St John of Kronstadt, St Elizabeth the New Martyr, St Herman, apostle to Alaska, St Innocent, metropolitan of Moscow and apostle to Alaska, St Tikhon, and St Daniel of Moscow. 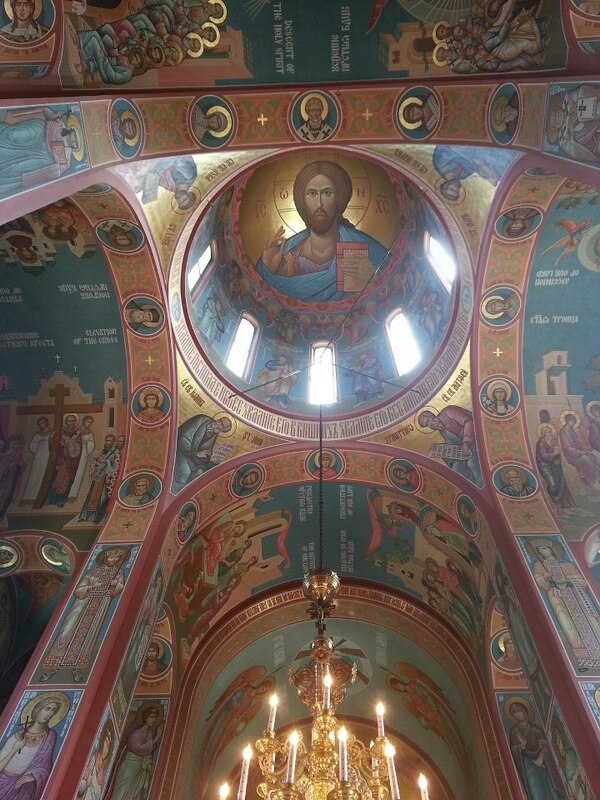 Gazing up at the dome with the image of Christos Pantokrator (Christ as Ruler of All, or Lord of the Universe) offering all worshipers His benediction. 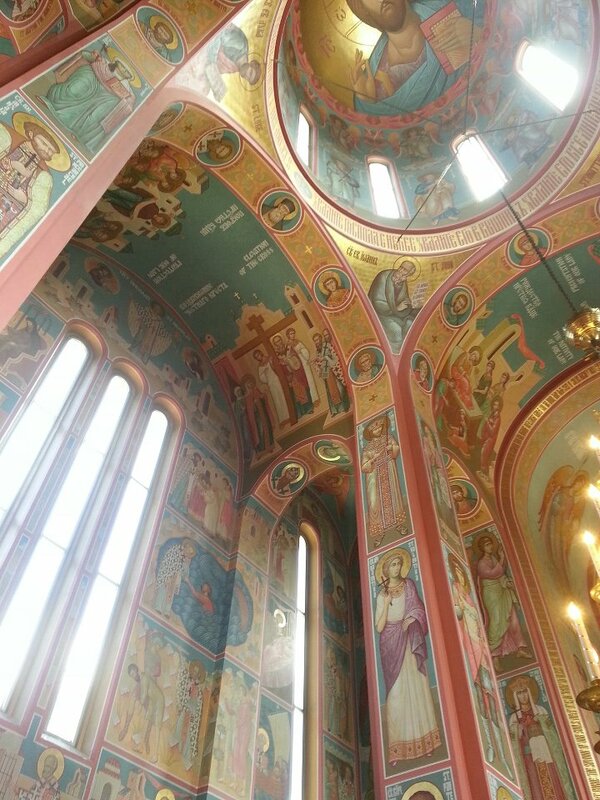 The choir gallery overlooking the nave, with beautiful frescoes of the Russian New Martyrs on the left and right as well as many of the North American saints. 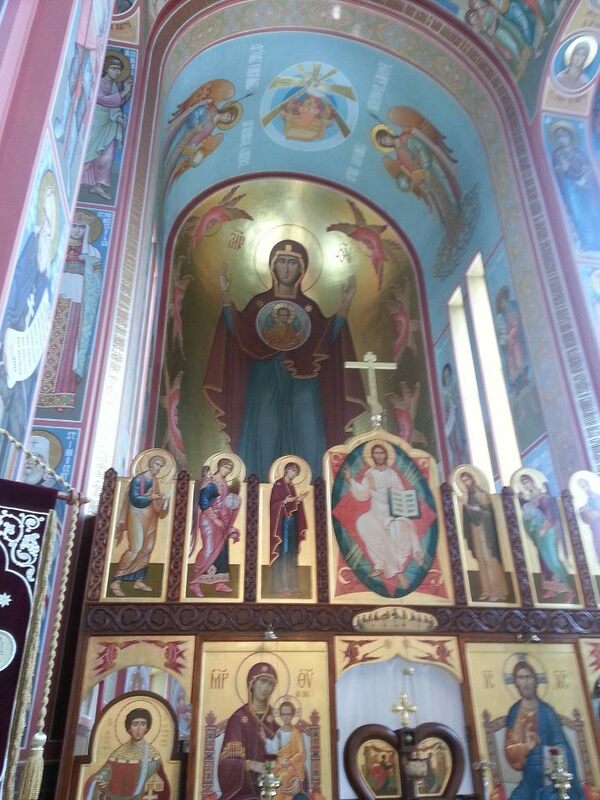 Note the magnificent fresco of Christ’s Resurrection on the wall hanging over the gallery as well as the ceiling icons of the Great Feasts of the Dormition of the Theotokos (L) and that of Pentecost, the Decent of the Holy Spirit (R). 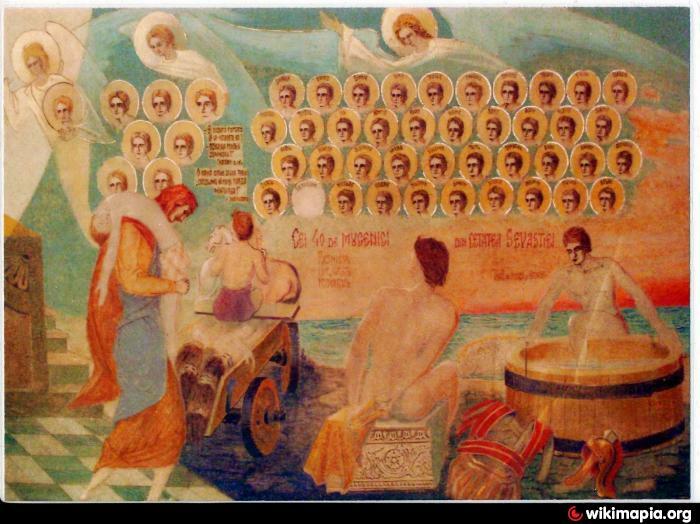 Symbolizing the triumphant restoration of Orthodoxy in Russian life, the fresco of Moscow’s rebuilt Christ the Savior Cathedral – initially demolished under Stalin’s orders in 1931- crowns the beautiful choir gallery. The four writers of the Gospels are depicted on the pendentives supporting the dome. Higher up, closer to Christ, are depicted the cherubim and seraphim and other angelic powers of heaven. 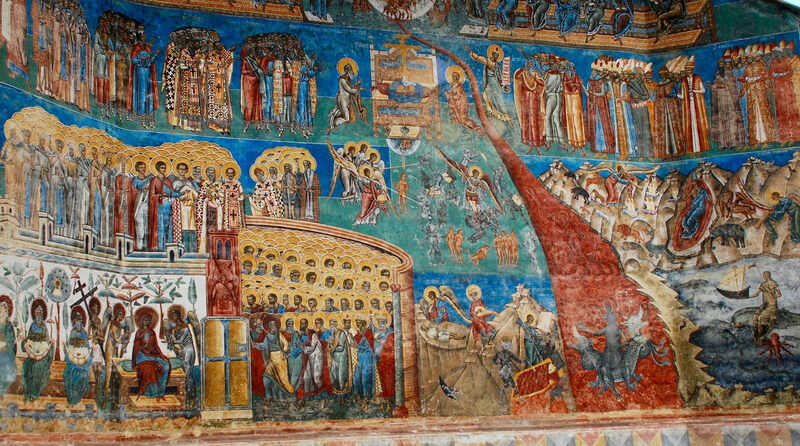 The red fire symbolizes the Holy Spirit descending to and filling the earth. 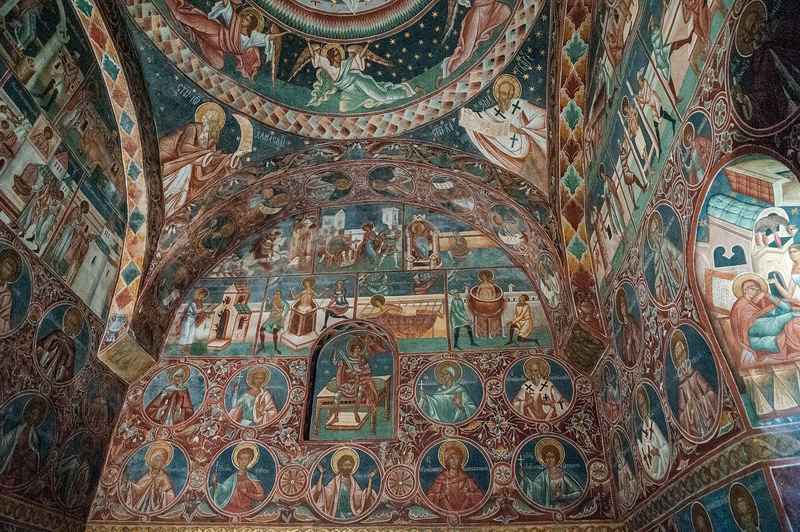 The frescoed icons on the Cathedral’s north wall depict the life and deeds of St Nicholas, the fourth century bishop of Myra (located in modern day Turkey), and patron saint of Greece, Russia, and many ancient cities. Can you find the picture of the saint rescuing a drowning man? 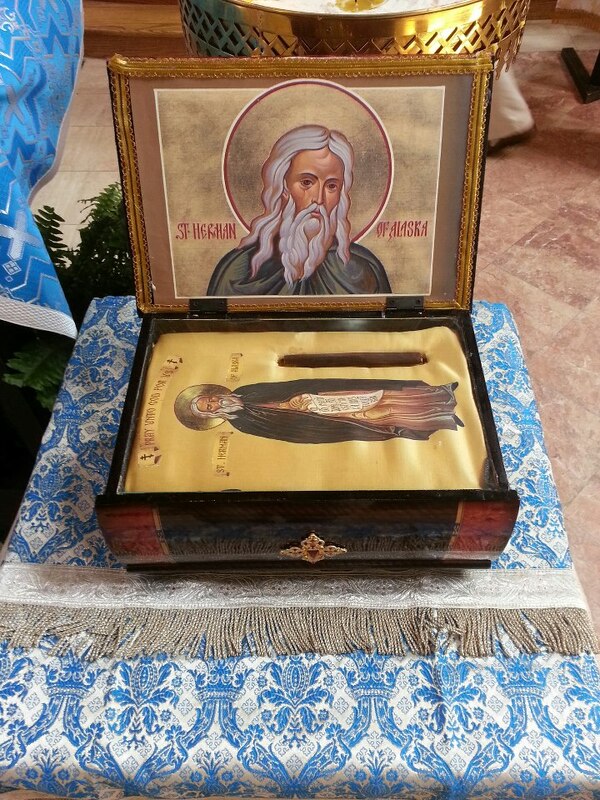 A reliquary of St Herman of Alaska (1756-1837), patron saint of Orthodoxy in the Americas and peaceful evangelist to many native Alaskan tribes. Relics of the Romanov Imperial Family of Russia, who were murdered on Lenin’s others on July 17, 1918: the Emperor or Tsar Nicholas Alexandrovich II, his consort the Empress Alexandra Feodorovna, and their children. Orthodox Christians venerate them as “Passion-bearers” who graciously and courageously bore many sufferings and imprisonment and went to their deaths with great fortitude. 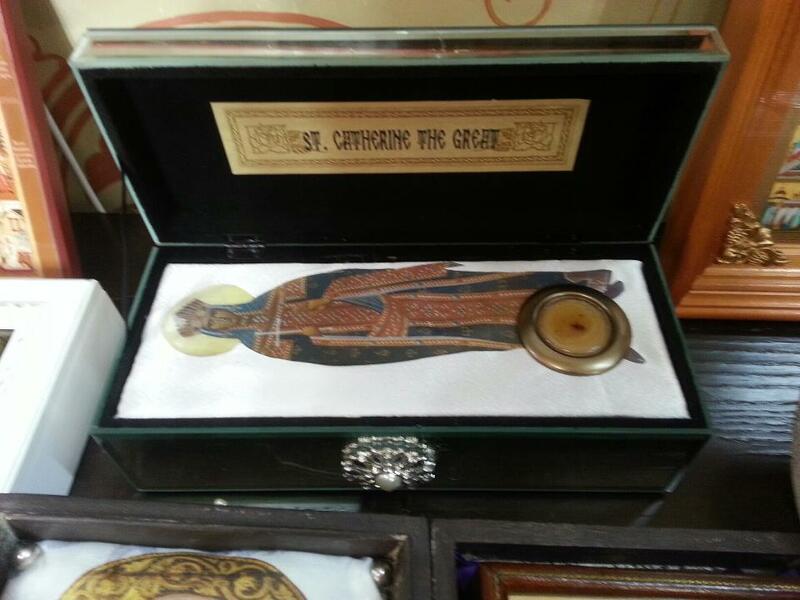 Relic of Saint Sergius, fourteenth century Wonder-worker and deeply beloved Russian saint (d. 1392). 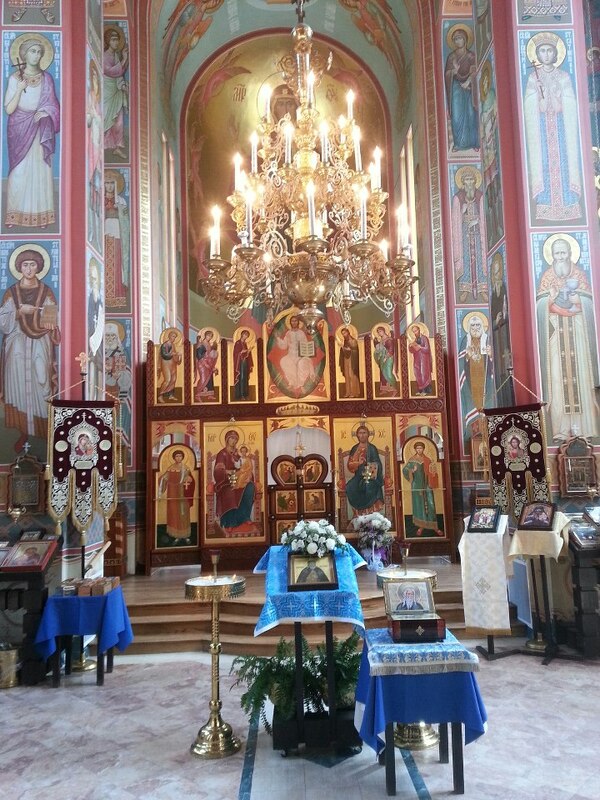 Looking toward the iconostasis and the apse above the altar. 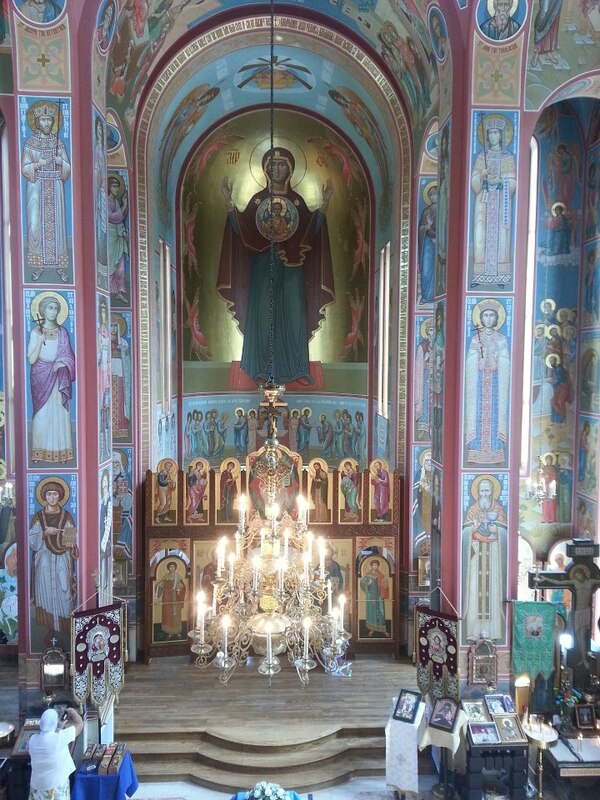 Along with most of the interior fresco work, after the fall of the Soviet Union expert Russian iconographers completed the beautiful iconostasis (icon stand) which separates the altar area from the main part of the Cathedral. This evokes the Temple at Jerusalem which had a ‘holy of holies’ in which the Tabernacle was kept. 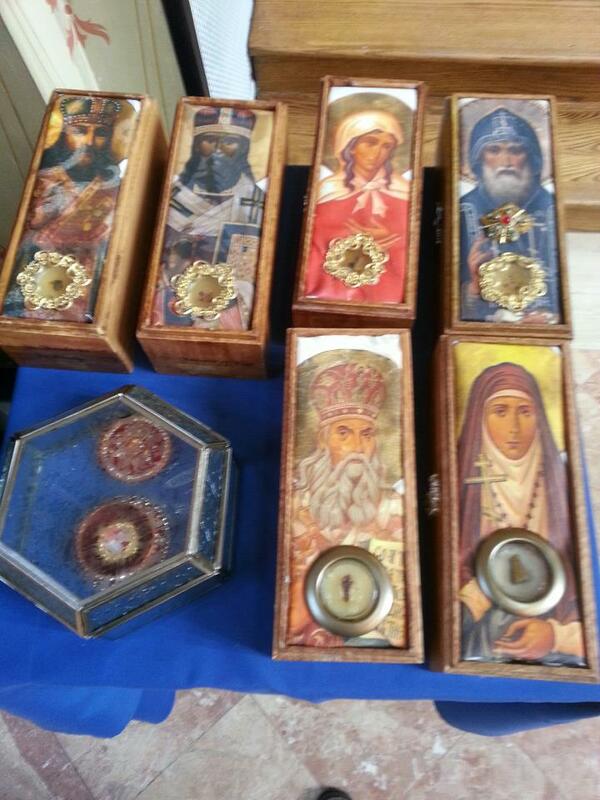 Relics of many ancient and new Russian saints, including St Elizabeth the New Martyr (front right). Saint Elizabeth (1864 – 1918) was the wife of Grand Duke Sergei Alexandrovich of Russia, fifth son of Emperor Alexander II of Russia and Empress Maria Alexandrovna (born Princess Dagmar of Denmark, she was the sister to Alexandra who became Queen of the United Kingdom as consort to Edward VII). Princess Elizabeth and her sister Alix, who in 1894 became the wife of the new Russian Emperor Nicholas II as Empress Alexandra Feodorovna, were granddaughters of Britain’s Queen Victoria. After an anarchist assassinated her husband, Grand Duchess Elizabeth visited the man, offering him her forgiveness, but he refused her offer to intercede with her brother-in-law for a reprieve from execution. She went on to found a convent dedicated to ministering to Moscow’s poor, and as part of her efforts she petitioned the Russian Church to restore the historic female diaconate. 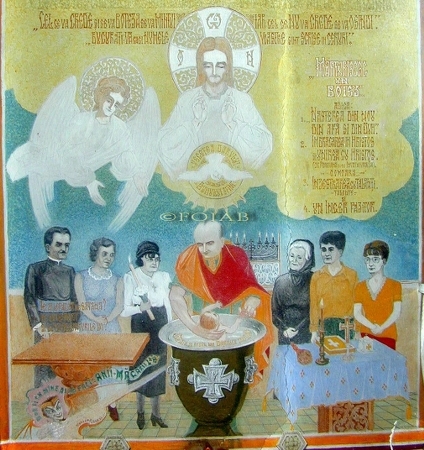 She opened the Martha and Mary Home in Moscow to utilize the prayer and charity of devout Russian women. For many years she helped the poor and orphans through this Moscow home. In 1918, the Communist government exiled her to Yekaterinburg and then to Alapaevsk, where she and several other members of the Imperial Family were violently killed by the local Bolsheviks on July 18, 1918. She was glorified by the Russian Orthodox Church Outside of Russia in 1981, and by the Russian Orthodox Church as a whole in 1992 as New-Martyr Elizabeth. Reliquary of the Great Martyr Saint Catherine of Alexandria (287-305), an Egyptian princess and scholar whose erudition and learned arguments inspired the conversion of thousands. She was brutally put to death on the orders of the pagan Roman Emperor Maxentius, whom Constantine defeated in October 312 at the Battle of the Milvian Bridge outside Rome. In the fifteenth century another virgin saint, the young Joan of Arc (Jeanne d’Arc) received visions of St. Catherine exhorting her to drive the English out of France. 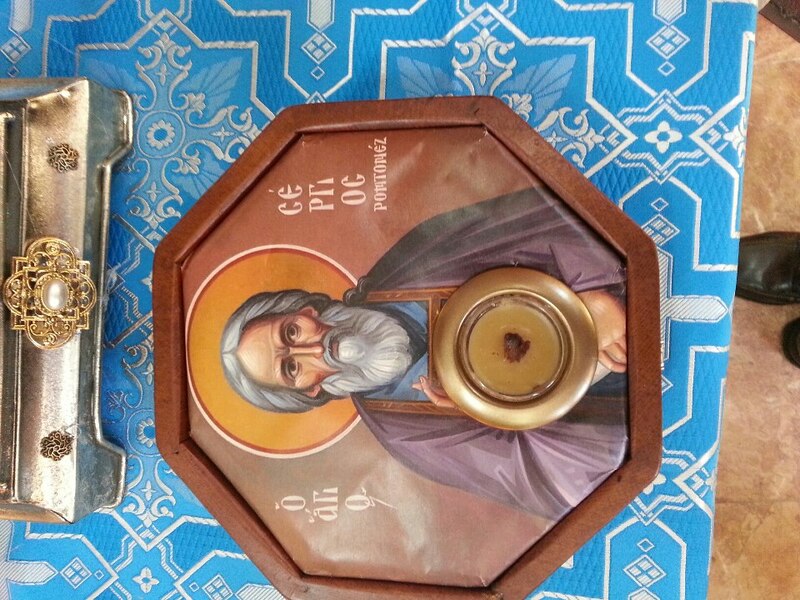 Fragrant double icon depicting two pillars of the Orthodox faith in Russia. Saint John of Kronstadt (1829-1908), shown offering the Communion chalice and a benediction, is one of the most beloved Russian saints to whom thousands would come seeking his ascetic and pastoral advice. He wrote widely on many topics, especially on the profound existential need to cultivate transcendent Christian love and forgiveness. 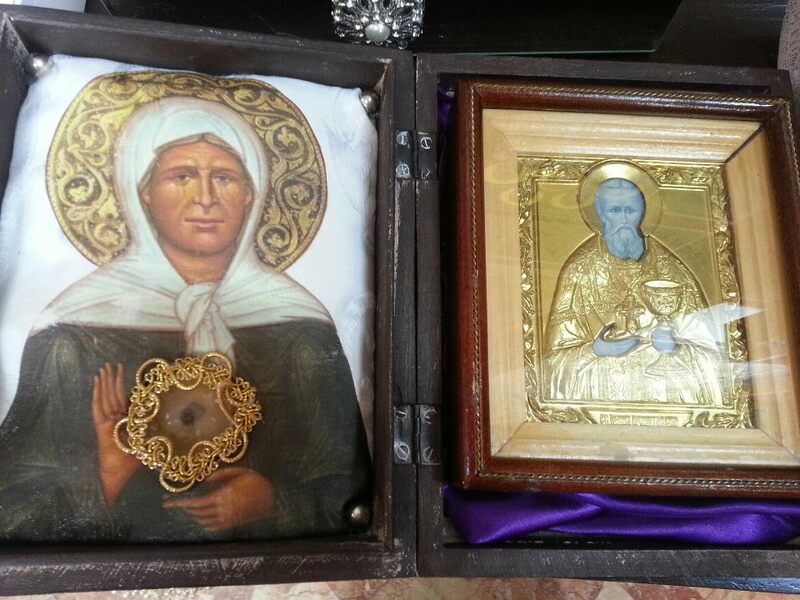 He is shown with Saint Matrona of Moscow (1885-1952) because when he saw her as a young, blind girl in a crowd, he predicted she would be his spiritual successor. Blessed Matrona healed many people of their spiritual diseases and predicted numerous marriages, events and deaths- including her own. 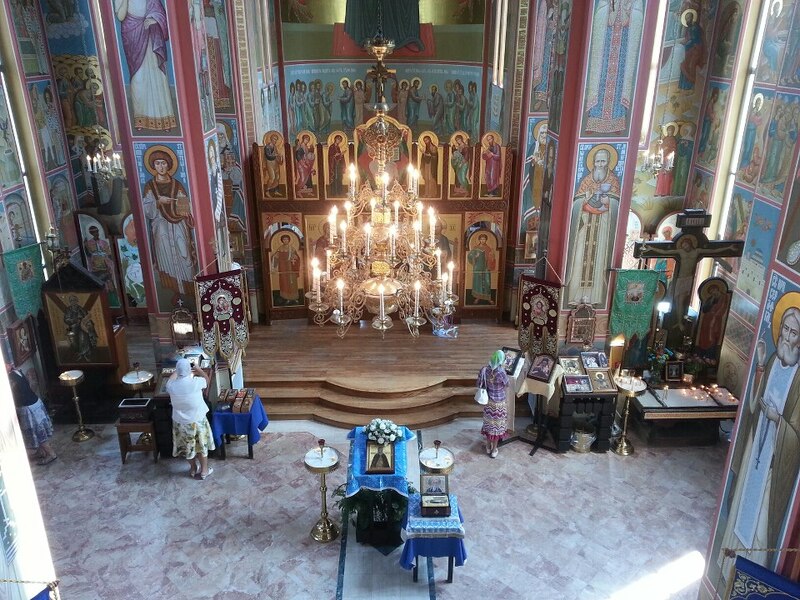 Standing in the choir, looking toward the iconostasis and the apse icon of the Panagia Theotokos (All-Holy Mother of God, the Virgin Mary). The elaborate chandelier, lit at various points of the divine offices, symbolizes the eternal presence of God’s grace in His Church, the radiance of the Kingdom of Heaven, and the abiding light of the Holy Spirit. Gazing down over the nave from the choir gallery. Approaching the central icon stand before the iconostasis, worshipers first venerate the cathedral’s principal icon of the holy person or God. Upon entering any Orthodox church, worshipers bow before the divine presence in the altar where the Eucharist is offered as the mystical transformation of bread and wine into the Body and Blood of our Lord. Standing in the lofted gallery where I sing with the choir. 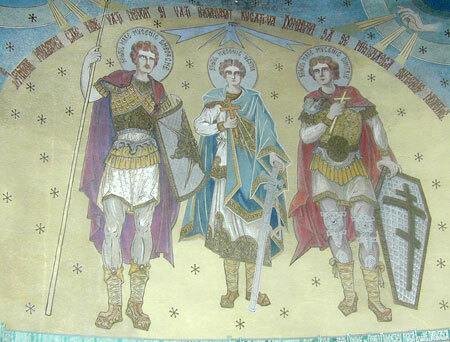 This is one of my favorite pictures of the Cathedral interior because one really has a strong sense of the iconography- the ‘image writing’, as the term means from the Greek- as a powerful tool for the theological education of the faithful who see and comprehend the many magnificent images depicting the saints. Centered shot of the dome and its supporting columns and pendentives. The Cathedral shining in the late summer sunshine! Russian and American architects designed the Cathedral to evoke a twelfth century church in Vladimir, an ancient Russian city on the Klyazma River some 200 km (120 miles) east of Moscow. 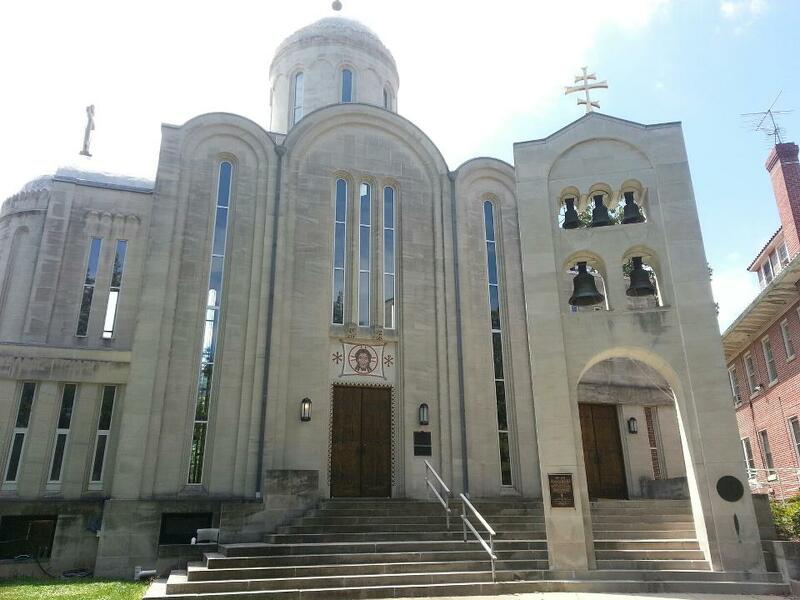 In 1988 the bell tower was erected as a gift from the Moscow Patriarchate to the Cathedral commemorating the one thousandth anniversary of the conversion of St. 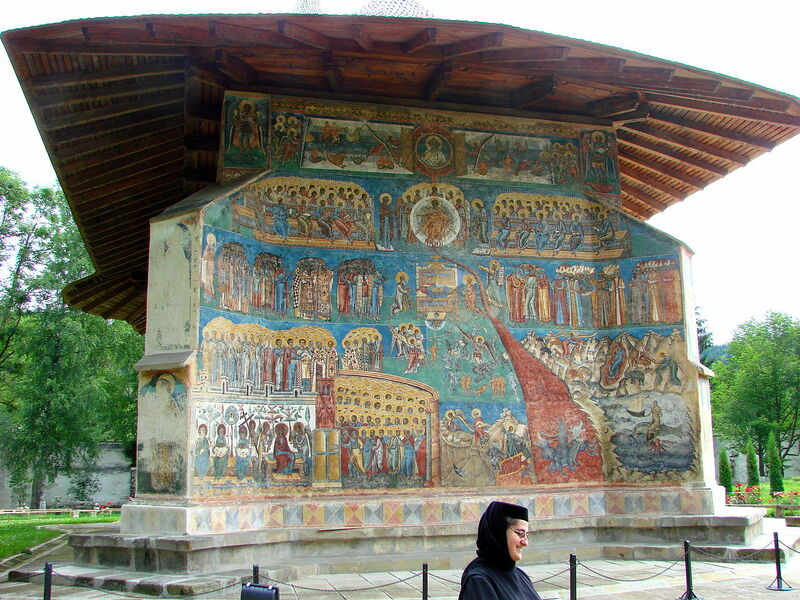 Prince Vladimir of Kiev and his people to Eastern Christianity.